Located 57 kilometers away from Tbilisi, Tetritskaro municipality in Kvemo Kartli region, is known with one of the oldest cultural, historical and natural sites. In Tetritskaro municipality, composed of 90 villages, agriculture is main source of income, but due to the lack of access to information, modern technologies, qualified employees, product market and many other factors, this field hasn’t been developed that is reflected in poor economic conditions in the municipality. Geographical location, landscape diversity, numerous historic monuments and cultural and ethnic diversity makes this region even more attractive for visitors, but its potential to develop as a popular touristic destination is not fully absorbed because of many barriers. Due to the lack of opportunities in the municipality, the number of migrants increases, and its population is shrinking. Migration is a big problem especially among young people who are moving to big cities in search of new development opportunities. 21 years old Levan highlights these problems when speaking about his municipality and expresses his regret that his region does not use its full potential, but he pins all his hopes on RDFG’s project on Tetritskaro development being implemented with the financial support of EU ENPARD programme and he, himself is one of the active participants of Employment Programme carried out under this project. 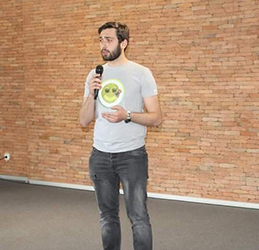 Levan is currently fourth-year student at Tbilisi state University studying at the faculty of law. Because of his studies he now lives in Tbilisi, but he spent his entire childhood in Tetritskaro and he keeps many good memories of his region, but he notes that nothing new was happening there at that time and the municipality could not offer any out of school learning opportunities to young people. He was tenth grade student when non-governmental organisations became more actively involved in youth development field developing training courses, organising public lectures and summer camps for young people. He was 15 years old when he wrote his first project and obtained a grant used to solve ecological problems in his municipality. Under his project, with the help of the municipality he and his friends installed public recycling bins, allocated a special garbage truck used to pick up waste and arranged recreation zones in the parks. Childhood, student life and successful career, this is how he imagined his life, but after leaving his own town and family he faced some difficulties and despite his independent and active lifestyle, he found some weaknesses hindering his personal growth. First obstacle he faced when he moved to Tbilisi was the adaptation to the new environment. Soon he got used to live independently in a big city, but he thinks that because of his passiveness in this process he missed many opportunities. In a few months he managed to tackle all these challenges and engaged in active student life. He was working with many non-governmental organisations, volunteering, participating in conferences and summer camps and his active life has supported his personal development, but when he first found himself standing at the crossroad in his life, his self-confidence has disappeared, and he found out that he was not able to make major life decisions. His strong will to overcome this barrier encouraged him to participate in RDFG employment programme. He was studying in Tbilisi when he first heard about Employment Programme from RDFG Facebook page, but he thought he wouldn’t be able to attend sessions in Tetritskaro and he forgot about it. After a while his friend told him about the programme and recommended him to participate. Levan decided to give it a try and soon he found himself among the programme participants. While participating in RDFG programme, he decided to challenge himself and applied for some projects. Several successful interviews gave him confidence in his abilities and convinced him that if you have an opportunity to advance your career and life, you shouldn’t allow your fear of failure to make decisions for you. From then on, he was working as a volunteer with RDFG project and gained a good experience in youth field. With the help of RDFG team he was teaching students of public school of Shaumiani how to write project proposals and some projects aiming to solve existing problems in their communities have even been financed. He is now one of the founders of non-governmental organisation „Future Lawyers Association”. 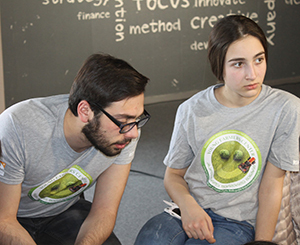 They are organising court simulation games, public lectures and training for students and pupils from Tbilisi and regions and he and his team are trying to use their time wisely and gain good practical experience while studying. 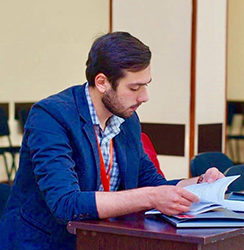 A few days ago, he was accepted for an internship programme and he will soon start working at Civil Cases Panel of Tbilisi City Court. Levan says that participating in RDFG Employment Programme changed his attitudes and approach first towards himself and then towards other issues and helped free himself from his excessive self-criticism hindering his development and helped him see his strengths. When he is speaking about the future, his main life goals are related to his profession and he wants to become successful lawyer. He says that he will try to the best of his abilities to achieve it. Moreover, he is not going to leave his region and he will do his best for the development of his community. He is particularly interested in youth develaopment and havea already acquired a quite good practical experience in this field. He wants to share his experience with young people from his region and offer them the opportunities he was missing when he was child. He is planning to implement projects using non-formal education tools supporting young people to develop personally and giving them self-confidence. When he is speaking about himself, Levan says that he is hard worker and maximalist and his loyalty never allows him not to do his best to achieve his goals. He thinks that his is a leader by nature, but he is a good team player as well. He has a talent to defuse any stressful situation and build a positive environment for the members of his team and these are the qualities always helping him succeed. RDFG team wishes him a big success in all his future endeavours and we are confident that he will achieve all his life goals and will manage to do many good things for his community.